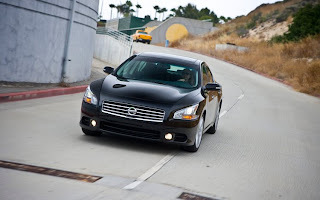 "For sure, a mere glance at the new Maxima confirms that Nissan has wrought dramatic changes. In an era when every model year seemingly brings "bigger, larger, fatter," Nissan has actually downsized its flagship four-door. Wheelbase shrinks 1.9 inches, length is cut by nearly four inches, and height is reduced almost half an inch. Importantly, though, track has widened 1.4 inches up front and 1.2 inches at the rear. While other cars have grown to accommodate an "expanding" audience (the Honda Accord comes to mind), the new Maxima is primed for responsiveness." "Engine output climbs significantly for 2009. Remapped for premium fuel, the ubiquitous 3.5-liter V-6 sports a new intake, reshaped pistons, and a less-restrictive exhaust, among other refinements-helping it deliver 290 horsepower (versus 255 for the 2008 model) and 261 pound-feet of torque (up 9 pound-feet). Yet estimated fuel economy actually improves, to 19/26 city/highway mpg (compared with 19/25 for the outgoing car). An electronically controlled CVT with sport and manual modes is the only transmission offering; paddle shifters are optional."